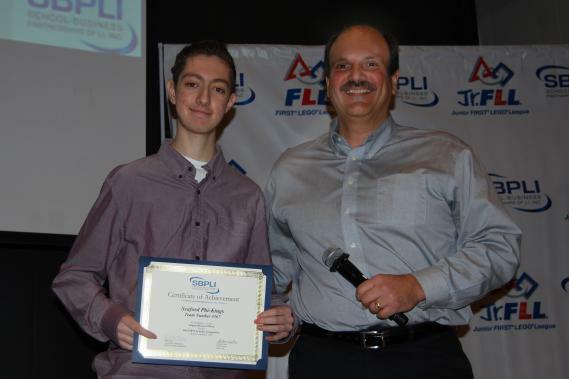 Nick Liuzzi (left), President, Seaford High School FIRST® (For Inspiration and Recognition of Science and Technology) Robotics Team #4567 “The Phi-Kings,” accepts a certificate from Will Recce (right), Principal, School Construction Consultants and Board Member, School-Business Partnerships of Long Island, Inc., after his team’s musical composition was chosen to be played at this year’s Long Island Regional FIRST® Robotics Competition. Will Recce, Principal, School Construction Consultants, Inc. and Board Member, School-Business Partnerships of Long Island, Inc. (SBPLI), announced that the Seaford High School FIRST® (For Inspiration and Recognition of Science and Technology) Robotics Team #4567 “The Phi-Kings” was the winner of this year’s musical theme contest, sponsored by WorkLife Resources, Inc. The song will be used at SBPLI’s 2016 FIRST Long Island Regional Robotics Competition (FRC), which will take place April 1-2 at Hofstra University. The presentation was held at the FRC kickoff event at Stony Brook University’s Jacob Javits Lecture Center on January 9. “The Phi-Kings” President, Nick Liuzzi, composed the winning theme song. Other teams participating in the contest included Pierson High School, Bay Shore High School, Plainedge High School, Walt Whitman High School and Westhampton Beach High School. Students worked with their robotics team mentors and the faculty members of their high school’s music department to compose their song. Members of SBPLI’s Development Council chose the winning entry. The Seaford High School FIRST Robotics team will be presented with a $1,000 check at this year’s Long Island Regional FRC.